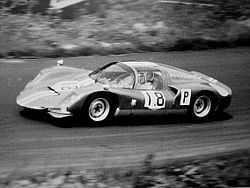 Joseph Siffert (7 July 1936 – 24 October 1971) was a Swiss racing driver. Affectionately known as "Seppi" to his family and friends, Siffert was born in Fribourg, Switzerland, the son of a dairy owner. He initially made his name in racing on two wheels, winning the Swiss 350 cc motorcycle championship in 1959, before switching to four wheels with a Formula Junior Stanguellini. Siffert graduated to Formula One as a privateer in 1962, with a four-cylinder Lotus-Climax. He later moved to Swiss team Scuderia Filipinetti, and in 1964 joined Rob Walker's private British Rob Walker Racing Team. Early successes included victories in the non-Championship 1964 and 1965 Mediterranean Grands Prix, both times beating Jim Clark by a very narrow margin. He won two races in Formula One for the Rob Walker Racing Team and BRM. He died at the 1971 World Championship Victory Race, having his car roll over after a crash caused by a mechanical failure and being caught under the burning vehicle. Siffert was married twice and to his second wife Simone during the height of his career in the late 1960s and at the time of his death. They had two children together, Véronique and Philippe. In 1968, Siffert drove into the F1 history books by winning the 1968 British Grand Prix at Brands Hatch in Rob Walker Racing Team's Lotus 49B, beating Chris Amon's Ferrari into second place after a race-long battle. This is regarded as the last GP victory by a genuine privateer. While Siffert's status in F1 grew slowly, his fame came as a leading driver for the factory Porsche effort in its quest for the World Sportscar Championship. In 1968, Siffert and Hans Herrmann won the 24 Hours of Daytona and the 12 Hours of Sebring in a Porsche 907, marking the first major outright wins for the company, apart from a few earlier victories on twisty tracks. Siffert at the 1969 Dutch Grand Prix. Later on, Siffert's driving displays in the Porsche 917 earned him several major wins in Europe. In addition, Siffert was chosen by Porsche to help launch its CanAm development programme, driving a Porsche 917PA spyder in 1969 and finishing fourth in the championship despite few entries. In 1970 he teamed up with Brian Redman to drive a Porsche 908/3 to victory at the Targa Florio. That same year, Porsche bankrolled Siffert's seat in a works March Engineering F1 since the German company did not wish to lose one of their prize drivers to rival Ferrari. His association with March in F1 was disastrous, so he was pleased to join rival Porsche racer Pedro Rodriguez at BRM the following season. 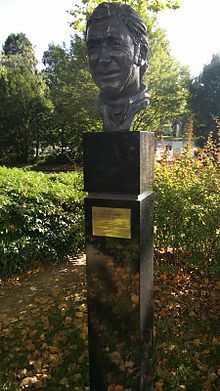 Siffert won the 1971 Austrian Grand Prix, and was later killed in the non-championship World Championship Victory Race at Brands Hatch, Kent, England, the scene of his first victory in 1968. The suspension of his BRM had been damaged in a lap one incident with Ronnie Peterson, and broke later. This was not admitted by BRM until much later when it was accidentally divulged by a BRM ex-mechanic. The BRM crashed and immediately caught fire. Siffert could not free himself from the burning car. This accident led to a rapid overhaul of safety, both in-car and on circuit. In the subsequent Royal Automobile Club (the UK organising and regulatory representative of the FIA at the time) investigation, it was discovered that the crash itself caused non-fatal injuries but Siffert had rather been killed by smoke inhalation. None of the trackside fire extinguishers worked, and it was found to be impossible to reach the car and extract Siffert because of the intense fire. On-board fire extinguishers (using BCF—bromochlorodifluoromethane, an aircraft product) became mandatory and also piped air for the drivers, direct into their helmets. His funeral in Switzerland was attended by 50,000 people and a Gulf-Porsche 917 of Team John Wyer led the hearse and procession through the streets of Fribourg. Benoit was a period Formula 1 sports reporter and knew Siffert well. He was also present at Siffert's tragic last Brands Hatch race in 1971. The night before the race, Benoit took pictures of Siffert, his wife Simone and his mother Maria as well as a friend Jean Tinguely at an evening victory celebration. He then also took the very last picture of Siffert alive as he sat waiting in his BRM in the pole position on the starting line five minutes before the start of the race. In the final round of the 2007–08 A1GP season, at Brands Hatch, the A1 Team Switzerland car carried the message Jo 'Seppi' Siffert - 40th Anniversary - Brands Hatch. This commemorated his 1968 British Grand Prix victory at Brands Hatch. ^1 – Formula Two cars occupied fifth to tenth positions in the 1969 German Grand Prix, however drivers of these cars were not eligible for championship points. The points for fifth and sixth were awarded to the drivers of the eleventh and twelfth placed cars. ^ "8W – What? – R R C Walker Racing Team". Retrieved 2008-04-19. ^ Benoit, Roger (24 December 2005). "Jo Siffert (7. Juli 1936 - 24. Oktober 1971)". blick.ch (in German). Der Blick. Archived from the original on 12 July 2011. Retrieved 20 January 2016. ^ Benoit, Roger (24 December 2005). "Jo Siffert (7. Juli 1936 – 24. Oktober 1971) Das Scheckheft des Todes". blick.ch (in German). Der Blick. Archived from the original on 8 July 2009. Retrieved 20 January 2016. ^ a b c "Profile for racing driver Jo Siffert". MotorSportMagazine. Retrieved February 4, 2018. ^ "All Results of Jo Siffert". RacingSportCars. Retrieved January 19, 2019. Lareida, Men (director) (2005). 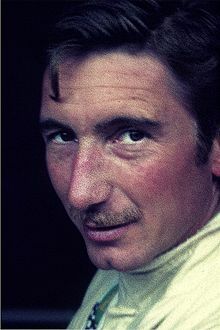 Jo Siffert. Live Fast, Die Young (DVD). Hugofilm. Whitelock, Mark (2006). 1½-litre Grand Prix Racing 1961-1965. Veloce Publishing Ltd. ISBN 184584016X. "F2 Register - The Formula 1, Non-Championship Races". Archived from the original on 2007-10-11. Wikimedia Commons has media related to Joseph Siffert.